Chaac was the name of the Mayan deity who was responsible for bringing rain down on Earth. According to Mayan mythology, Chaac was armed with an axe which he used to strike the clouds. And when he struck the clouds with it, it caused rain and thunder. Since Mayans heavily relied on agriculture and required rain to successfully harvest sufficient amount of food from crops, they considered Chaac a very important deity and attempted to please him through different rituals. 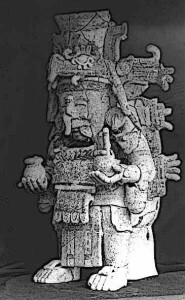 The Aztec equivalent of Chaac was Tlaloc who, like Chaac, was tasked with providing rain to the Aztecs and was associated with water. As the key deity in the Mayan pantheon of rain deities, Chaac was associated with a number of rain myths. One curious myth in the Mayan sources narrates that Chaac was the brother of the Sun. Together, the two brothers defeated their adoptive parents. Later Chaac committed adultery with his brother’s wife and was punished for it. According to this version of myth, Chaac cries to repent for his sins and it is this that causes the rains. Maize was the staple diet of the Mayans and it figures prominently in many Mayan religious symbols. This is understandable because maize was essentially the lifeline crop for the Mayans. Many Mayan deities are associated with it and this includes Chaac. According to a Mayan myth, the rain deity Chaac was one of the key figures responsible for helping open the mountain in which maize was hidden. Mayans performed a number of rituals to please Chaac. The primary purpose of these rituals was to plead with the god to bring them more rains. Rainwater was critically important to help Mayans gather enough fresh water for drinking as well as to have enough water for their crops. To this end, Yucatec Mayans performed a sort of ceremonial banquet for Chaac in which four boys would dance and perform to please the god. Similar rituals were performed by Mayans as late as the 16th century at different cenotes. Typically, these rituals involved young men and women being thrown into the cenotes or lowered into them. In some cases, they were left to drown whereas in other cases, they were brought out of the cenote after being thrown in. It was believed that a person who had been brought out of the cenote had oracular powers. In many Mayan sources, Chaac is depicted as having a human body which is covered with reptilian scales. His head is also depicted as non-human, set with an unusually long nose and fangs. The Axe is the weapon which Chaac carries in many of his depictions. It is the same axe which, the Mayans believed, was used by him to strike the clouds and bring them rain. Along with the axe, Chaac is also seen as carrying a shield in many Mayan depictions from the Classic period. Mayan concept of Chaac was multi-layered. They considered Chaac to be one and yet many. This is manifest in the fact that Mayans associated Chaac with the four cardinal directions. They believed that a different Chaac ruled over each of the four directions and each wore the colour that were traditionally ascribed to each direction by the Mayans. In more recent Mayan beliefs, the four different Chaacs are positioned hierarchically so that they have varying importance and significance. The rain deities in these four cardinal directions were named along the format, “The rain deity of the west”. During the Classic Mayan period, many Mayan rulers assumed the titles of these deities, so that the King of Chichen Itza was called “the rain deity of the east”. Although the key role ascribed to Chaac by the Mayans is that of a rainmaker, he is also associated with thunderstorms. For this latter trait, he was considered related to warfare as well. This may be the reason why Mayan kings often dressed up as the rain deity when embarking on wars. This was done to emphasise on the furious aspect of Chaac. So when a Mayan king dressed up as him, it was to depict the furious rage of the King in waging the war. Mayans believed that Chaac was directly concerned with agriculture. He was considered the patron deity of agriculture. In Mayan mythology, Chaac is one of the deities who helped open up a mountain and found the secret, hidden maize. This brings out the true importance of Chaac in agriculture because maize was the most important crop for the Mayans. Since Mayans had to rely heavily on rainwater for drinking water, for crops and for various other purposes, rains were critically important to their survival. So while at one side they constructed reservoirs to store water when it rained, at the other they looked to Chaac to bring them a good rainy season each year. In one version of Mayan mythology, nubile women represent maize and other vegetables grown by the Mayans. And Chaac is considered a father to these women. Chaac was the rain deity in the Mayan pantheon. He was the Mayan equivalent of the Aztec Tlaloc. It was to him the Mayans looked when they wanted rain. Since rain was critically important for growing maize and other crops, the Mayans also considered Chaac a patron deity of agriculture. He was credited with being among the key deities who helped discover corn and offer this knowledge to mankind. Mayans sought rain from Chaac by performing different rituals in his honour. These included the dance and acting of young boys. Another ritual meant to honour Chaac involved the drowning of young men and women in cenotes. In Mayan sources, Chaac is represented as a formidable deity with an axe which he uses to strike clouds for rain. He is also shown to hold a shield and has scales all over his body, resembling him to amphibians or reptiles. Although Mayans had several rain deities, Chaac was probably the most prominent rain deity in their pantheon.